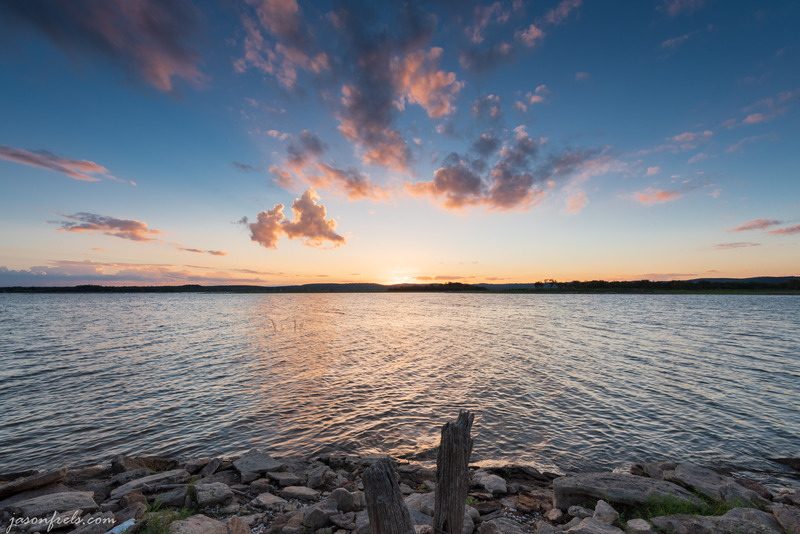 I have been wanting to go check out Lake Buchanan, which is north of Inks Lake. Lake Buchanan is bigger than Inks Lake but is mostly private property on the east side of the lake. There is a public accessible park on the east side of the lake called Canyon of the Eagles Nature Park. There is a resort there, but also a lot of park land that you can pay a small fee to use. I have been to this place before as it hosts star viewing events at the observatory there. On Sunday I decided to drive up there and scout around for nice afternoon and sunset photos. I ended up at a day use area that is close to the lake. The lake was about 8 feet below full pool, which is better than it usually is. I remembered to bring bug repellant and I needed it; the insects were thick in the air. 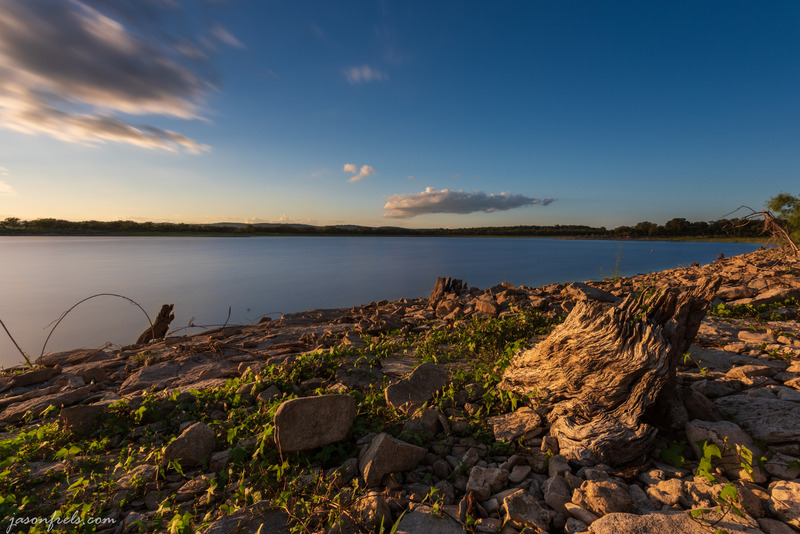 I walked around the rocks on the shore of the lake in the afternoon sun and eventually settled on a composition that I wanted to try. There were a couple of old weathered stumps that formed a line leading across the lake to the horizon. They were surrounded by some bright green vines that caught a lot of the sun. I liked the way this contrasted with the cool blue lake and sky. I positioned myself so that I could get the warm late afternoon sun to bring out the texture of the wood and have the line of the stumps pointing to the middle of the photo. I got the camera down low with a wide focal length, so that the foreground would be accentuated. There is also an old cable running into the water on the left, that I think adds interest to the composition. In this blog, I want to walk through and discuss the steps that I took to get to the final image. I chose a long exposure to get a smooth lake and some motion in the clouds. To do this I set up a composition and set focus; I then installed the 10-stop ND filter and adjusted the shutter time and enabled the remote control shutter release. I then waited for the sunlight that I wanted. Below is a JPG exported by Lightroom from the RAW file before I started making adjustments. The white balance was set by the camera. The main goal was to not over-expose the sky; the foreground is dark, but the data is all there and I can bring it up in Lightroom. I included the RAW histogram in the image so you can see where I started. I could probably have exposed a little longer, but this is hard to gauge with a long exposure, especially when the light levels are changing near sunset. 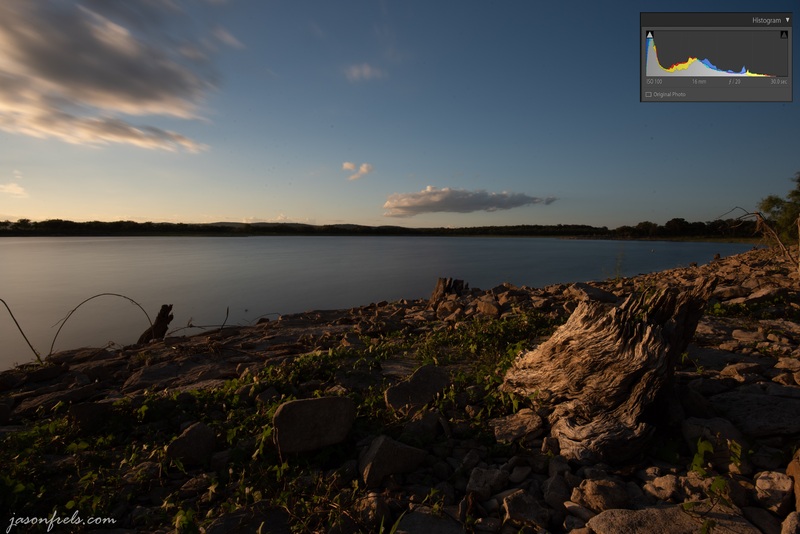 Apply the Adobe landscape profile which brings up the warmer tones that you find in a landscape setting. This is usually my starting point for a landscape photo. Adjusted the exposure, shadows, and highlights to get more out of the foreground without losing the sky. These steps kind of give me an idea of what I can do with the picture. See the image below. I used the adjustment brush tool and selected the lake and reduced the clarity to enhance the motion blur. I put a graduated filter over the sky and dropped the exposure about a stop. Since this image was taken at f/20, every spot on my sensor and lens showed up, so I spent a lot of time with the spot removal tool cleaning up the sky. I also adjusted the vibrance to enhance the greens and yellows in the foreground and dropped the blue luminosity to bring the sky down a little. From start to finish, this probably took me about an hour to do in Lightroom. I am not expert at post-processing, but this got me about what I wanted in the image below. Before I got this final shot, I took a few test shots as there was a cloud blocking the sun. When the cloud finally blew out of the way, I got all of the sunlight I wanted on the weathered old stumps and vines. The motion blurred clouds in the upper right sort of push your eye to the center horizon. I like the texture that I got out of that weathered stump and I think that this photo turned out well, and about like I envisioned it. Using the adjustment brush tool to reduce clarity on the lake only is a subtle touch that I hadn’t tried before, but I like the way it turned out. It was quite a bit of work, carefully masking the lake, but I didn’t mind so much. I also really need to have my camera sensor cleaned after about 10 months of use. I am hesitant to do this before my upcoming trip and the noise is really only noticeable at super tight apertures. A little while later the sun set. I set up behind a couple of little stumps and tried to make a foreground with the sun setting just over these stumps. The sky was not terribly spectacular and I probably should have gotten the camera down a little lower behind the stumps. While I was there I also experimented with reviewing and editing the photos on my iPhone on the fly using WiFi to transfer images to my phone and then the Lightroom mobile app to edit. I will have more on this in my next blog. Please add your comments or questions below. I hope you enjoyed and thanks for reading. Hats off to you for the editing work. I usually don’t have that much patience! I quite like the last one as well, would it work with in a portrait format with just the centre third of the picture? One of my many weaknesses as a photographer is that I don’t often consider the portrait orientation when out shooting landscapes. So, I probably should have considered that. I have ordered an L-bracket that will easily allow me to swap camera orientations on my tripod. Perhaps this will help me consider this option in the future. On that last picture, I really didn’t put the same effort into visualizing the composition as I did with the first picture. I see things that I could have done that would have made it a better photo. I was kind of watching the sunset at that point and triggering the camera occasionally. I wish I had brought the tripod down lower and gotten the two stumps up closer to the horizon to sort of showcase the sun. A portrait orientation may have work well with that too.